Developed as a fusion of the point-and-click and visual novel genres, ‘Nairi: Tower of Shirin’; the debut game from Home Bear Studios is an ambitious adventure game. But can it measure up to the best games in either genre? The point-and-click genre has enjoyed a renaissance recently. The huge Kickstarter successes of ‘Thimbleweed Park’, ‘Broken Age’ and ‘Broken Sword 5’ clearly illustrates just how many people are keen to revisit a genre that they adored in the eighties and nineties. While platforms like the Adventure Game Studio has allowed for the creation of this Style of game on Steam and Android systems, until the Switch they never felt at home in consoles. 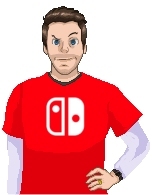 However, perhaps due to the system’s touch screen interface many point-and-click titles have found a home on Nintendo’s hybrid device. Big names such as ‘Grim Fandango’ and the ‘Syberia’ trilogy can be found in the eShop but lesser known indie hits like ‘The Darkside Detective’, ‘The Lions Song’, ‘Bulb Boy’ and ‘The Fall’ have also seen Switch success. Alongside the re-emergence of point-and-click games has been the Western acceptance of Visual Novels. ‘Steins; Gate’, the ‘Zero Escape’ series and the ‘Muv Luv’ games have attracted legions of western fans, and reading interactive books on a video games machine is no longer a Japanese only activity. Trace the two genre’s family trees back far enough and there’s a point of intersection. Both visual novels and point-and-click games evolved from titles like ‘Enchanted Sceptres’ and ‘Déjà Vu’. ‘The Portopia Serial Murder Case’ (「ポートピア連続殺人事件」) is considered by many to be the first Visual Novel. It challenges a player to solve mysteries by interacting with items, characters and the game world. Retro Gamer magazine claims the game “defined the visual novel genre; it was the first from which all subsequent titles followed”. Evidently, the game's developer, Yuji Horii was inspired by American titles. “I read an article in a PC magazine about a US genre called ‘adventure games’, which allowed players to read stories on their PCs. We still didn't have them in Japan, and I took it upon myself to make one”. The game presents Nairi’s story; a young girl forced to flee her home when a criminal known as White Mask breaks in. Turning to Rex, an elegant scholar with a murky past, she is smuggled out of familiar opulent surroundings and thrust into the city’s seedy underbelly. This game, the first chapter of a planned series, revolves around Nairi’s attempts to make her way back home. “We wanted ‘Nairi: Tower of Shirin’ to be family-friendly and enforce ourselves to tell an impactful story while keeping the tone light and colourful” notes van Kuilenburg. While the game may look adorable, the developers have been keen to point out that child appropriate doesn’t mean it’s dull for adults. “Anyone who’s ever seen a good Pixar or Ghibli movie knows that cute art styles and mature stories are not mutually exclusive. ‘Nairi’ is definitely appropriate for children, but adult players are more likely to appreciate the more subtle themes and character development”. The whole game feels wonderfully charming, even if it does look somewhat primitive without animations. Environmental changes, for example the collapse of a wall, will be shown in two stages: An image of an intact wall will cross dissolve into an image of a collapsed one. In the games’ defence though, many visual novels blessed with infinitely larger budgets do similar short cuts. With ‘Nairi: Tower of Shirin’ being part visual novel, when not searching environments and solving puzzles, most of your time is spent in dialogue with other characters. Thankfully the text is large enough to read in both handheld and docked mode as there’s no voice-overs, “a conscious choice” by the developers “to keep the narrative experience consistent with ‘Nairi’s art style”. Navigation and environment puzzles feels more like a first person point-and-click game like ‘Myst’. Items are found hidden in plain sight and sourcing them frequently feels like a hidden object mobile phone game; you tap or click your pointer all over the screen hoping that something usable will be found. 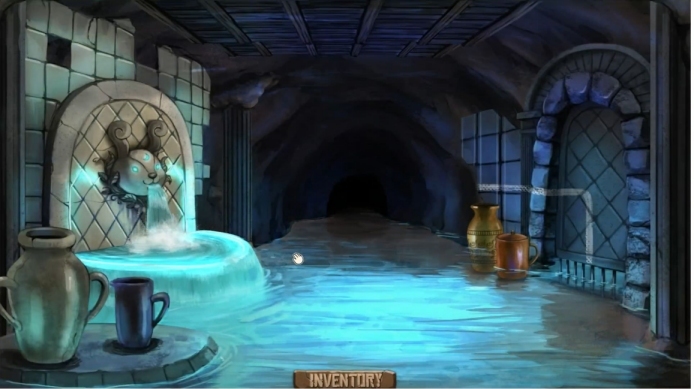 In true point-and-click kleptomaniac fashion, pocketed items are kept in an inventory to be used to solve environmental puzzles; they can even be combined with each other. Thankfully puzzle solutions never become as absurd as some LucasArts game, instead you’ll find an obstruction (like a boarded up window) and then need to find or create a logical solution in the rooms you have access to (like using a crowbar). Clues are dotted around locations. For instance, a sketch beside a locked door will reveal the order a set of buttons must be pressed to open it. Home Bear Studios are clearly fans of Levels 5’s DS adventure games, as hidden alongside items and clues are invisible coins. 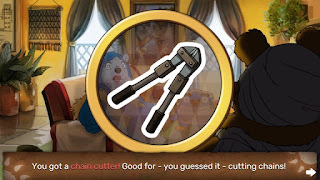 As you tap on them you even get a near identical sound and animation to that seen when you discover a hint coin in a ‘Professor Layton’ game. 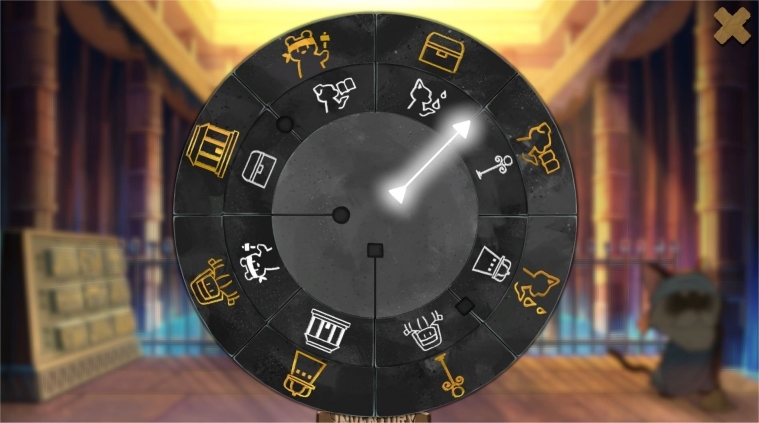 In ‘Nairi: Tower of Shirin’ these coins are currency used to buy needed items, rather than exchanged for assistance solving a tougher puzzle. Instead, for help you must refer to a hint book that’s given to you Partway through the adventure. The clues it contains are vague and I found it actually complicated some puzzles. ‘Professor Layton’ influences aren’t limited to coins though. As you play through the game, puzzles increase in complexity, with progression occasionally halted by a sliding puzzle or block rotation conundrum. Unlike games featuring Hershel Layton though, none of the brain teasers are that taxing. With some note taking you’ll spend minutes rather than hours solving them, which does make the game much better suited to children and those playing a point-and-click game for the first time. “A synergy with so many ideas, strong storyline and tantalising puzzles, plus appealing to a wide audience with compelling gameplay has been our goal” Joshua van Kuilenburg notes. 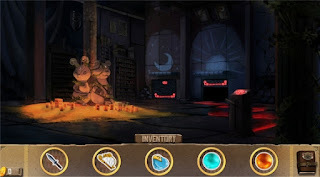 “We believe that we have achieved this through our love of the adventure genre.” There is a satisfying feeling of accomplishment when a puzzle is solved of course; this sensation is often the reason many play these adventure games. 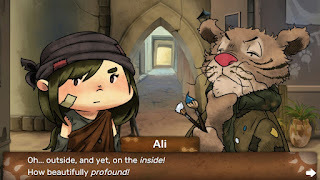 ‘Nairi’ also has the ability to inspire less desirable emotions though, principally frustration, especially when played in tablet mode. Most locations feature multiple screens and, when using the touch controls, navigation between them involves tapping the edge of the touch screen. There’s a noticeable loading pause between each scene, even when you’re only trying to see the same room from a slightly different perspective. While this is bearable, it becomes increasingly more tedious when you don’t intend to change location and are simply tapping to see if an object on the edge of the play-area is usable. ‘Nairi: Tower of Shirin’ is much more playable using the JoyCon’s analogue sticks as it makes a mouse pointer appear on screen. This more classic point-and-click control interface allows for greater Precision. As it’s contextual, the appearance of the cursor will change according to what will happen when the action button is pressed. Bizarrely, manipulating the pointer with the Pro-controller was problematic as it seemed to move erratically around the screen. The environments maybe detailed but there’s rarely clear signposting for what can and can’t be interacted with. For example, in an early location a drape can be cut with a knife to solve a puzzle. However in all the rooms nearby, other similar looking drapes can’t be slashed, in fact they can’t be manipulated at all since they are only part of the background image. A spare JoyCon button could have been used to highlight adaptable parts of the screen. It wouldn’t detract from the challenge, but it would avoid the need to tap or click on everything the second you enter a previously unseen environment. Point-and-click veterans will know the trick to use in this situation though; the infamous pixel hunt. This is when a player systematically and slowly moves the cursor over the screen taking note of when it changes to an interact icon. It’s laborious but it’s also something we had to do thirty years ago. Again, this can’t be done in tablet mode as the touch controls remove the game’s cursor reinforcing that docked and tabletop modes are the optimal way to play. I personally prefer my point-and-click games to be played from a third, rather than first, person perspective. This is perhaps why Throughout ‘Nairi’ I felt disoriented in locations. With rare exceptions, the game has no map. There are also no scene-transition animations, so it’s never that Obvious which door you’ve come through and which direction leads to somewhere new. Leaver filled underground caverns became a chore to navigate because, despite my best efforts I kept on doubling back on myself. I also spent far too long on some puzzles owing to the fact I needed an item from a location that I didn't even know Existed. The contextual cursor when JoyCons are used helps as the pointer turns into an arrow when you hover over the entrance to a new screen, but there’s no reason why the d-pad couldn't have been used to move between all accessible screens. It’s sad that it’s a multitude of niggling frustrations that stops this good game from being great. 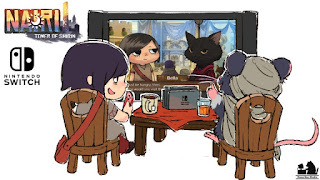 ‘Nairi : Tower of Shirin’ is undeniably a huge accomplishment for such a small team with a minuscule budget, but at times it feels like more hands or a chance to iron out the kinks would have benefited the final product. 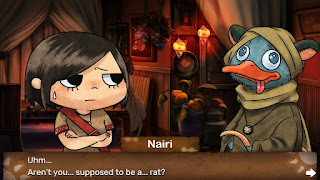 While it doesn’t do anything new, and borrows heavily from games like the ‘Professor Layton’ series, ‘Nairi’s isn’t as original as Home Bear Studios claim it to be but that doesn’t mean it’s not worth your time. 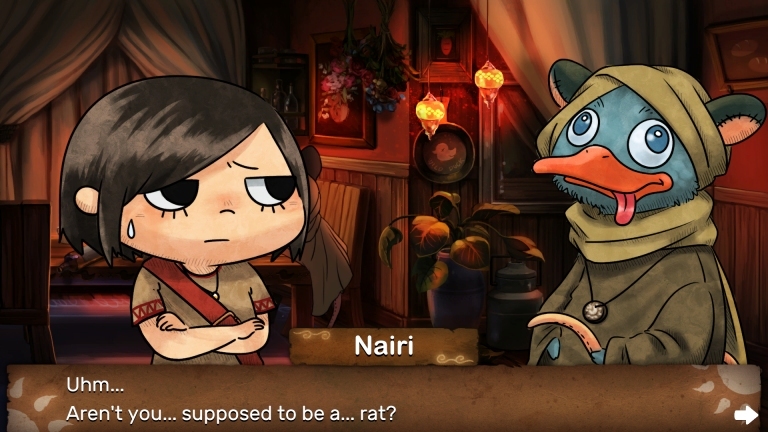 There may be a flood of superior Point-and-click games and Visual Novels on the way to the Switch, but for fans of either genre ‘Nairi’ is certainly worth your time while you wait. Who knows, maybe the inevitable sequel can sit proudly amongst the best of them. A copy of this game was provided by the publishers for review. They have not seen or had any influence on the content of this review prior to publication.